On the 28th of February, the European Youth Guarantee should become a reality. 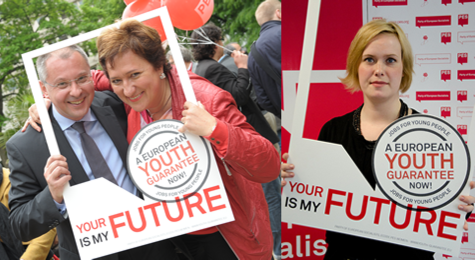 For the PES family, this will be only the beginning - Your future is my future - a European Youth Guarantee now! When the Party of European Socialists (PES), PES Women and ECOSY (European young socialists) campaign “Your future is my future: A European Youth Guarantee now!” started taking its first steps, we knew that we were making an ambitious, long-term commitment. Our campaign officially began one year ago, and we have been fighting ever since, both at European and national level, with the help of thousands of PES activists and the crucial support of our social democratic family. Our goal was to generate new and decent jobs, to improve education and training systems and to provide young people with the opportunities to build their own future. And now we are about to reach a major goal. This Thursday (28th February) in Brussels, the Employment and Social Affairs Ministers of the EU will meet to formally discuss a European framework for Youth Guarantees. Our PES Ministers will make sure that the package as proposed is defended and adopted. That hugely important moment for our campaign follows on from the last European Council in Brussels, where our PES Heads of State and Prime Ministers ensured the allocation of 6 billion euro in the EU budget to kick-off a European-wide Youth Guarantee. The PES employment and social ministers then met informally in Dublin to discuss a common position that urges the Council recommendation on the Youth Guarantee to be adopted as soon as possible. All these efforts should serve as a trigger effect across the European Union to tackle the youth unemployment crisis. This would have not been possible without the strong efforts of our social democratic and socialist Heads of State, Prime Ministers, Ministers, Social Affairs Commissioner Laszlo Andor and members of the European and national parliaments. Together, not only have we made sure that our proposal has been heard, but also that significant funding has been identified to make the Youth Guarantee a reality. But as we have said in the past, the current proposed funding (6 billion) must be increased. We need 10 billion euros allocated to ensure that access to youth guarantees is truly European-wide. We need to secure the release of these funds immediately. They should be matched by national funds for Youth Guarantees. We need to make sure that these schemes are intensively used to create more and better jobs and education and training of better quality. This should just be the start of EU funding to tackle youth unemployment. Funding this issue is not an expense in a time of crisis- it is the exit door from the crisis. We have demanded solidarity between countries and between generations. We have urged protection for the citizens who have been affected the most by the crisis, particularly young women – whose unemployment rate is higher and who are more likely to end up in precarious jobs. The Gender Dimension of the European Youth Guarantee is integral to its success. Combating gender segregation in certain professional sectors and in education is the best way to improve the number of women in new/green jobs and the IT/research sectors. Unless we make this a priority, we risk many types of discrimination against women on the labour market which will lead to an ever widening Gender Pay Gap. As we speak, 5.7 million young unemployed Europeans, more than the entire population of Denmark, are demanding swift action before it is too late. Now, that we are so close, our progressive family needs to redouble its efforts to bring the European Youth Guarantee to the finish line. Thanks to our friends in the Irish Labour Party, we are confident that the Irish Presidency of the Council of the European Union will help us keep the pressure on. We have urged and demanded, and the collective strength of the Party of European Socialists has delivered. On Thursday, European-wide Youth Guarantees should go from being part of the debate on youth unemployment to being part of the solution.